Showing results for tags 'Jewfish'. 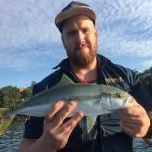 I've recently decided to target some jewfish for the first time and was wondering if anyone knew any good land-based spots to go fishing for one along or near the northern beaches. Any additional tips on catching jewies would help too. Hawkesbury River jew spots ? G'day fellow Fishraiders, I am a newbie here and have just recently started beach fishing along with my cousin TheSillySalmon. I have a beach rod however it is pretty average. I am just looking for some advice on what some of the best rods, reels and other tackles on the market are for beaches. At the moment I am aiming for Aussie Salmon however in the future I will also be trying to hook up some bigger fish like Jewies and other species. All answers are appreciated. Cheers, TheFreakyFlatty. Got to rosebay boat ramp around 3pm. Did not start off to well as I left the boat key in the shed back home which was 1 hour away. Luckily I have a pull start Yamaha also. Got in amongst the boats at rose bay for yellow tail as usual, but they were not there. My theory is the current and wind was strong. Never the less fished with baits near Clifton and the wedding cake closest to it. For not much result. Refusing to accept defeat, at around 5pm I headed back to rosebay to try again for yakkas to try and have livies down at sunset which was also a change in tide. Got to rosebay, and noticed swarms of baitfish on the sounder in amongst the boats. The yakkas were back!! Managed to fill the live bait tank up with 8-10 and headed out to a reefy bottom near the first yellow bell as you go out towards the heads from rosebay. As soon as the first yakka hit the water, within minutes I was on, and landed my first jewfish at 73cm. we continued on landing a nice tailor and several spat hooks with scaled or skinned yakkas, we knew the jewfish were on the hunt below us. At sunset with a little light left, my last yakka got smashed. After a short fight I winched it our slob for the night. My PB jew at 82cm. What started off as bit of a disaster with the boat key and no yakkas or fish for a few hours ended up paying off really well!! G'day raiders. Thought I'd share an unproductive, but potentially helpful day out on the river today. Dangar Island resident, former avid Fishraider (5 years ago). Been fishing but not talking a lot and a friend mentioned I should chuck a report up and give back to the community! Started out the day at West Head around 11am. Burleyed up for Yellowtail, heaps there but some rat Kings were giving the little fellas some hassle. Couldn't manage to stop them and an eel took the yakka we put near the rock on a floater (painful). On the run up tide fished the Juno drift (if you know it, you know it. Otherwise DM me for details). Jeez, I've never gone through yakkas so fast once dusk hit. Something big was hitting them all hard. Couldn't stop on a Shakespeare 20kg overhead rig and busted two of them before we called it quits (lack of gear). It's the first time I've seen Juno firing like that. I've had a lot of luck with Jewfish this season, but that drift on yakkas was very surprising. Highly recommend going and checking out Juno if you're looking for some fun. Next time I'll be bringing the 30kg rig in! So Sunday morning came. I'd organised to go fishing but wasn't feeling too motivated or enthusiastic. The winds would be too strong, it was already too late in the morning, the tides wouldn't be right. The usual list of reasons. But decided about 8am to head up to Akuna Bay then motor up to Brooklyn. Beautiful morning and the enthusiasm is on the way up. Picked up a packet of frozen prawns, thinking won't catch anything on these but got to try something. Arrived at the railway bridge about 9:30 at the peak of the runout, so thought why not drift through with some light lines. Might even pick up a flathead. Second drift through and I thought I'd snagged something. The little sow and pigs puller rod is bent right over so I'm thinking that it's a log when all of sudden it takes off. By the time we'd drifted right down to Dangar Island, I'd landed my first ever Jewie at 80cm! So the moral of the story is .... just get up, go fishing and you never know when you're going to be lucky! On the prowl for Jewfish - Need some tips and tricks! I've been heading out to the local fishing river for the past few weeks trying to land myself a jewfish. I understand that these fish are known to be incredibly elusive, with some fishermen spending up to months and even years without lady luck blessing their lines. I am not discouraged however, i'm more than certain that when the day comes where I feel the drag of a monster at the end of the line it will be worth it. Does anyone have any tips as to what rigs and bait to use whilst fishing for Jewfish? Any help would be appreciated. Cheers and good luck out there! Happy New Year Raiders! It’s been a while since I have posted and one of my resolutions was to get out more, so here is a report based on what happens when you do. Kat and I have been waiting for this break for a very long time! We have been so busy with work and other projects that we have had very little time to fish together, or at all for that matter. This season I have had a very good run on the bass but not on a lot of other target species. We decided to fish Sydney Harbour with my brother so headed of the day before to stock up on some tackle, a few new lures and some new squid jigs. We received a bit of info from one of the guys at ‘On Duty Bait & Tackle’ that there were a few kings being caught in the harbour. Being that we were going out within the Boxing Day Sale period I had ‘NO CHOICE’ but to buy some new and heavier gear in the form of a Shimano Raider Rod and 5000 Reel. We left the house at 5am the next morning and by some freak change of heart I decided to scrap the Harbour plans and drove to the Hacking. 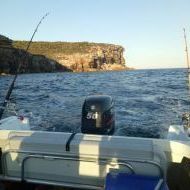 We launched in Yowie Bay with the plans of catching live bait. I felt a little squeamish at the fact we had to rely on my captaining abilities to land squid and yakkas so we grabbed some prawns from the ‘Bait & Go’ machine just in case. My plans were to try for a few squid around Jibbon Beach but the swell was a little too big at this point to take the Tinnie close to the heads so we pulled up short at Salmon Haul. We anchored up and within a few casts the Mrs was on and this thing was massive! We ended up with a few lollypops and another bigger model over the hour but decided to send a few out in hopes for kings. We headed into one of the bays near some moored boats and got a burley trail going. Throwing over some pillie cubes and squid guts, a little action showed up on the sounder. We rigged up with some squid head and threw them overboard. Within a matter of seconds Kat was on and it sent the drag screaming. After a 10-minute fight we got it to the boat and she had her first taste of the silver ghost!!! We measured her at 68cm… Yewwwwww!!! Unfortunately, The fish leapt off the boat seat and down between the cross brace and floating floor that supports the motor. I tried to get the Jewie out carefully, unaware that its gill rakers had gotten caught on the other side of the brace. We swam her for 10-15 minutes to no avail, every time it swam off it went belly up. Shortly after this, the bite went off after tide change. The brother caught a small pinkie but that was it. It was still a little too choppy to get closer to the heads to try for kings so we called it quits. We decided to take the remaining squid home with the Jewie, which happened to end up as a sensational meal! If people would like to shed some light, my question is: What is the best possible outcome for an event like this? We filmed the fish not being able to swim off in case we ran into the fisheries department. Is this the correct protocol? Apologies for the novice question but we couldn’t find the information anywhere. Photos attached. Thanks, Paul. G'Day Ladies and Gents, I've been pillaging these forums for hints and info for so long that I've felt it only right to start sharing back a bit of detail, be it useless or otherwise. I haven't been on the water much this year, but finished work and study around 2 weeks ago and have hit the harbour hard over the past two weeks. All in all, there were certainly kings around, but in general and compared to say last season they were hard work to both find and make bite. On the positive side all the standard locations were forthcoming with live squid (I don't really take bait, or lures, out fishing) and in basically ten days straight I didn't not get a decent quorum of willing (later very unwilling) team-mates in a short time. (This season most shops stock yamashita 1.5s and they're the bomb, throw your 2.5s away) I hit the water for the first time on about the 11th of Dec, and for three or four sessions straight couldn't find a king to save my life inside the heads despite lots of big action on the sounder. All charter mates reported good action on the inshore reefs but almost nothing inside (save one or two secret big successes which i daren't repeat in public). Temps inside were over 23c but just outside the heads were only 19c... Anyway i must have dragged thirty live squid and cuttles around for nada. depressing. A few days of big surface action between the wedding cakes, clearly kingfish, but live squid and strips were obviously not on the menu. Late dec got better, from the 15th to the 25th i didn't fish the harbour without boating a king (55-78cm no hoodlums) except the 23rd which after a long kingless day i was dragging the last dead remnants of my last livey over the bottom of some deep holes (sweep and pinkies have been angry in the lower harbour, killing and chewing all little live squid to bits in seconds and just leaving you dragging a mantle around) I had the strangest hit I've ever experienced, combination of real violence and total dead weight (thinking monster lizard? ray?) ended up being a Jew which went 95, very happy. (at like 11am go figure) Ive never caught, or targeted, Mulloway in my life but iIsuppose of you drag that many live squid around our estuaries one will show up eventually. Certainly can claim any Jew skill. Also had a small live squid ambushed at the south wedding cake by the biggest calamari I've seen in NSW. Have caught bigger in TAS but never here, this unit prob went 30cm mantle, a relic of last spawning. He came home for dinner. Anyway, there were fish around last few weeks but the kings were very hard to tempt, and live baits very very hard to get past the pickers. (Perhaps I should give more time to finding slimies and yakkas, at least the sweep and pinkys won't eat them.) Also, heaps of tailor to a very good (High 40s plus) size in middle harbour eating anything moving. Thanks for all your tremendous help over the years, I've taken so much info off you all i decided it was time to start feeding back. Have a good summer ladies and gents. On an interesting note after a week straight of good fish in the harbour, i went up to Pittwater to visit some family and fished every day for a week for nothing except a few choppers (again with good live squid baits every day.) Hard going up there with all the pros still at it i think. Went out for a flick in a spot of mine in middle harbour (near spit) and Paddled out on my little dinghy on Monday afternoon on the low tide. Brought with me just one soft vibe, some leader and pliers in the hope of picking up a jewie, was fishing in about 35ft and hopping the vibe back over a ledge I'd previously found. After about 2 hours, felt a little tap and then a solid weight on the other end, 2 long runs of zzzzzzz and 5 minutes later managed to bring him up, a nice jewies coming in between 60-70cm. A few quick snaps and back in the water he went and off to work I headed! I was using 10lb line and 10lb leader on a Stradic 3000 ? Was a lovely afternoon out there with a slight breeze and beautiful sunset!